On Saturday morning, Axios put together a quickie post, "3 lies heard 'round the world," and I'm sure you know exactly who told the 3 whoppers. He claimed he bent NATO members to his will, which never happened. He tried walking back his trazodone-fueled interview with The Sun, calling it "fake news," even though they released a tape. Trump countered that he has his own tape and told reporters to "get it from Sarah." Huckabee's daughter has no tapes. Her drug-addled boss also claimed that the indictments of a dozen GRU officers for helping Putin steal the election for him is a "rigged witch hunt," after being briefed by his own Justice Department "on the most extensive foreign invasion into our elections since we won independence... The disregard for honesty in the Trump era... is eliciting new research and polemics from philosophers, literary critics, political analysts and social scientists." Saturday's Toronto Star led with a piece by DC Bureau Chief Daniel Dale on Saturday, Trump has said 1,340,330 words as president. They’re getting more dishonest, a Star study shows. 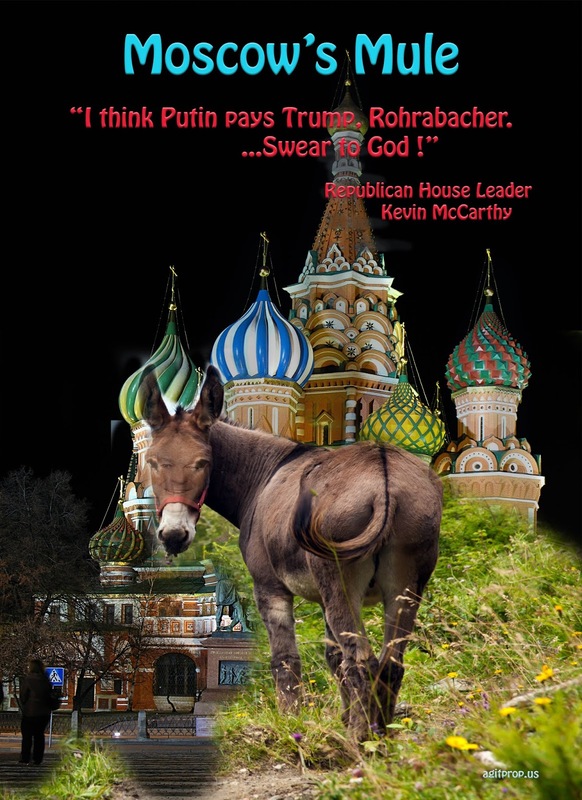 The words of the vile and disgusting Russian cut-out masquerading as an illegitimate "president," are, he wrote, "getting more dishonest over time, the Star has found in the first detailed statistical analysis of his inaccurate statements in office. The analysis relies on some subjective judgments, which we’ll explain in detail below. But it provides the most comprehensive picture yet available of what historians say is an unprecedented avalanche of serial lying." And they deliver. 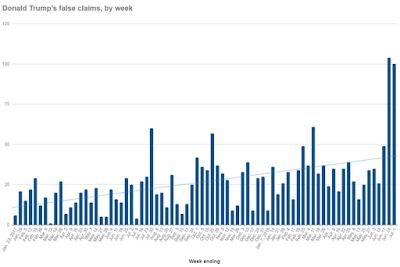 The number of words Trump utters in a week varies widely depending on what happens to be on his schedule-- it often jumps in weeks when he holds one of his hour-long campaign rallies, for example-- but it is generally increasing over time. Trump has averaged 484 more public words per day in 2018 than he did in 2017-- 2,856 vs. 2,372, a 20 per cent increase. 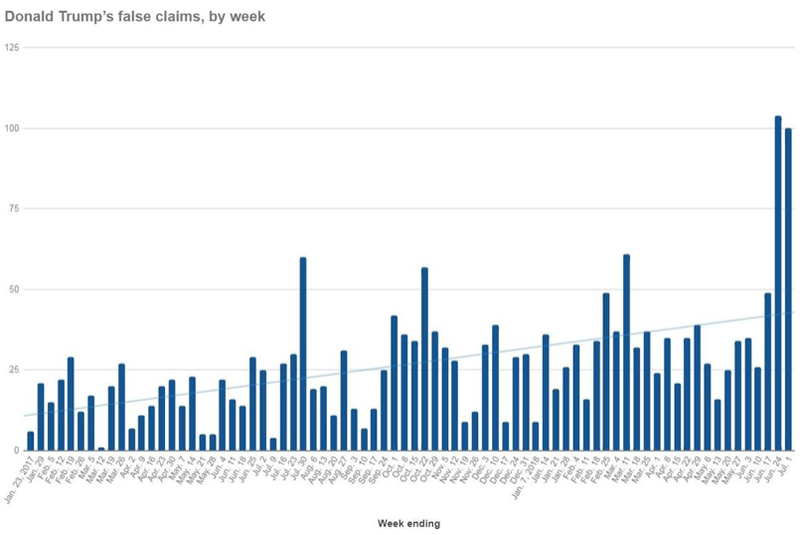 There is a strong statistical correlation-- .73, on a scale that goes up to 1-- between the number of words Trump speaks in a week and the number of false claims he makes in a week. The correlation is getting stronger with time: it was .55 in 2017, .89 in 2018. What’s more notable about the data: Trump makes the second-most-false claims, 380, in interviews. This is interesting because of how few interviews he gives-- it depends on how you count, but it’s under 60-- and how friendly most of the interviewers are. According to presidential tracker Mark Knoller, a CBS reporter, Trump had given 26 interviews to Fox News since taking office as of mid-June; he’d given no more than six to any other outlet. So Trump is usually not being pressured into false claims because of tough questioning, he’s just making them. The bulk of his daily lies isn't meant to convince normal people of anything. Normal people know he's a congenital liar who can't be trusted. Polling shows the overwhelming majority of Americans recognize he's a liar. Some care and some don't. His barrage of lies is meant to give his supporters some kind of plausible deniability that they made a huge, historic mistake based on their own stupidity and gullibility and that they should probably lose the right to vote either permanently or until they've passed a civics course. But then there are the self-serving lies-- the swamp lies that move forward his kleptocratic agenda. Adam Davidson covered a perfect example in the July 13th New Yorke, Where Did Donald Trump Get Two Hundred Million Dollars To Buy His Money-Losing Scottish Golf Club? Short version: the Russian Mafya's money laundering operation. Turnberry is a loser, shedding tens of millions of dollars that has cost the Trump Organization hundreds of millions of dollars-- and it isn't just because Trump is one of the worst businessmen in history. Trump has proclaimed himself the “king of debt,” a proud master of “doing things with other people’s money.” So it was quite surprising when Jonathan O’Connell, David A. Fahrenthold, and Jack Gillum revealed in a Washington Post story in May that Trump had abruptly shifted strategies and begun spending hundreds of millions of dollars in cash to fund projects. In the nine years before he ran for President, the Post reported, the Trump Organization spent more than four hundred million dollars in cash on new properties-- including fourteen transactions paid in full. In fifteen years, he bought twelve golf courses (ten in the U.S., one in Ireland, and a smaller one in Scotland), several homes, and a winery and estate in Virginia, and he paid for his forty-million-dollar share of the cost of building the Trump Hotel in Washington, D.C.-- a property leased to Trump by the U.S. government. But his largest cash purchase was the Turnberry, followed by tens of millions of dollars in additional cash outlays for rehabbing the property. ...Even before the financial crisis of 2008, Trump found it increasingly difficult to borrow money from big Wall Street banks and was shut out of the rapidly growing pool of institutional investment. Faced with a cash-flow problem, he could have followed other storied New York real-estate families and invested in the ever more rigorous financial-due-diligence capabilities required by pension funds and other sources of real-estate capital. This would have given him access to a pool of trillions of dollars from investors. Instead, Trump turned to a new source of other people’s money. He did a series of deals in Toronto, Panama, the Dominican Republic, Azerbaijan, and Georgia with businesspeople from the former Soviet Union who were unlikely to pass any sort of rigorous due-diligence review by pension funds and other institutional investors... He also made deals in India, Indonesia, and Vancouver, Canada, with figures who have been convicted or investigated for criminal wrongdoing and abuse of political power. We know very little about how money flowed into and out of these projects. All of these projects involved specially designated limited-liability companies that are opaque to outside review. We do know that, in the past decade, wealthy oligarchs in the former Soviet Union and elsewhere have seen real-estate investment as a primary vehicle through which to launder money. The problem is especially egregious in the United Kingdom, where some have called the U.K. luxury real-estate industry “a money laundering machine.” Golf has been a particular focus of money laundering. Although the U.K. has strict transparency rules for financial activity within the country, its regulators have been remarkably incurious about the sources of funds coming from firms based abroad. All we know is that the money that went into Turnberry, for example, came from the Trump Organization in the U.S. We-- and the British authorities-- have no way of knowing where the Trump Organization got that money. The goal of laundering money is to take the proceeds of a criminal activity-- government corruption, tax fraud, drug trade, or many others-- and to disguise its origin. Many oligarchs in the former Soviet Union who made their money by expropriating the state’s wealth want to move their money into a more stable nation with greater rule of law. This presents a challenge: How can one insert illegally obtained funds into a system that requires due diligence? The answer, quite often, is to use shell companies to disguise the flow of funds. Although we cannot say that Trump himself knowingly engaged in money laundering, we do know with certainty that much of his business in the past decade was in the industries most known for money laundering, in the locations most conducive to money laundering, and with people who bear the key hallmarks of money launderers. Trump Lies. This is news? How about telling us what is being done about Trump and his fascist cabal deep into the process of destroying this nation? He's quite good at it. And the reason is that nobody has ever called him on any of it. Whether it's because he's rich or has an army of lawyers ready to sue... everyone just lets it go. Especially the Nazi party... but also the democraps. His lies ARE his life story. And we American voters worship him for it. says far more about us than it says about him.